Is Rent Control An Answer To California's Housing Crisis? 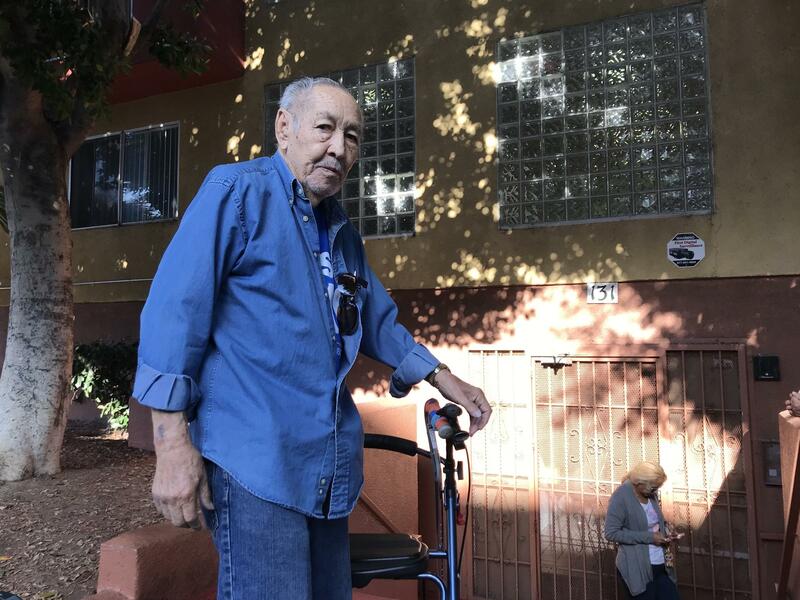 Robert Rodriguez, 82, couldn't afford the rent increases at his apartment in Los Angeles and worries he could end up on the streets. Tenants angry over what they say are greedy rent increases protest outside an apartment building in Los Angeles. You can add Robert Rodriguez to a growing list of Angelenos living right on the brink of homelessness. Rodriguez shares his story, talking softly, as he leans on his walker outside his old apartment. He was evicted the day before. "Everything is gone," he says. "It's all in storage." Rodriguez, 82, used to be a truck driver. He's on a fixed income and has had health problems including a heart attack. Last February, when his landlord notified him and his wife that their rent was going up by 15 percent, to be followed by a likely 30 percent to 40 percent increase soon after, he couldn't afford it and didn't pay. They went to court instead, but eventually lost. He was evicted last week. "So I had to leave," Rodriguez says. But where can he go? His neighborhood, densely populated MacArthur Park with its worn midcentury apartment buildings, is gentrifying fast. Landlords are suddenly asking — and getting — $2,000 a month in rents or higher. Rodriguez is worried he'll end up homeless. "It's an embarrassment more than anything else," he says. "At this point in my life, I should be sitting in a rocking chair waiting for the pearly gates to open up for me." New census figures show that California has the highest poverty rate in the nation because of its affordable housing crisis. And the state is now home to nearly a quarter of the country's entire homeless population, despite making up only 12 percent of the U.S. population as a whole. One proposed fix is Proposition 10, billed as a local rent control initiative, which will go before voters this November. It would repeal a 1990s-era law called the Costa Hawkins Act, which generally prohibits rent control on most places built after the 1970s, bars local cities from expanding rent control, and allows for units to move to free-market rates after rent-controlled tenants leave. Peter Dreier, a former city housing official in Boston and current public policy professor at Occidental College, says Prop 10 is a key first step to addressing California's broader affordable housing crisis. "Wages are stagnating for the majority of working families and rents and home prices are going up much faster than wages," Dreier says. He says the system is stacked against renters. A recent report by the National Low Income Housing Coalition calculated that just to afford market rent in Los Angeles right now, one has to make at least $32 an hour. "We have a shortage of housing that's affordable to school teachers, firefighters, janitors, garment workers," Dreier says, in other words, all the people that make a city or community tick. But Prop 10 has its detractors, including people who build low-income rental housing. Elizabeth Bluhm is a project manager at a San Diego-based nonprofit developer called Wakeland Housing. She's worried that if Prop 10 passes, there could be a patchwork of cities with different rent control laws and limits, making "it very hard for developers to get things done efficiently," she says. "It just adds to the cost of development." Bluhm says even just a little uncertainty threatens funding for a project because developers need to know how much rent they're going to bring in to cover their costs and ensure they don't go underwater. Private development firms like hers, she says, are on the front line of fixing the housing crisis because federal housing subsidies for the poor have steadily declined since the 1980s. Opponents of Prop 10 have frequently called it a Band-Aid. The root of the problem, they say, is that there's just not enough housing. "The real solution to our affordable housing crisis is more construction of housing across the whole spectrum," Bluhm says. In fact, the California Department of Housing and Community Development estimates the state needs to build 1.8 million more units by 2025. This is a perennial challenge in a state with some of the most restrictive zoning laws in the country and where land is already in short supply. A lot of developers, citing the high costs of labor and building materials and concerns about getting a good return on their investment, are building only high-end units. That in turn is fueling a lot of the anger — and momentum — behind the push to expand rent control in California. As in a lot of booming cities, residents of Los Angeles are watching as whole blocks are demolished to make way for luxury homes and big, fancy apartment complexes advertising amenities like pools, libraries and tennis courts. 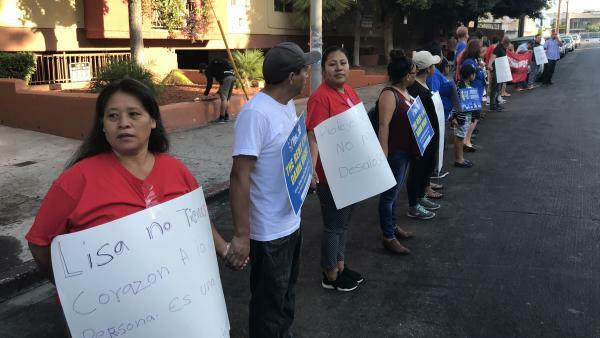 In front of Robert Rodriguez's old building near MacArthur Park, Prop 10 supporters and some of his neighbors recently held a protest over the rent increases. They chanted loudly, "The rent, the rent, is too damn high," as passing drivers honked in support. The building's owners say the rent increases were modest and are needed to cover maintenance costs. They also say, even with the increases, the rents are below market rates for the area. For now, Rodriguez says he and his wife will stay with his sister while they desperately look for a new place. "If you don't have family, you got a problem," he says. "MacArthur Park is filled up, all you got left is skid row." Rodriguez hopes it doesn't come to that. New census figures paint a troubled picture of California. The state has the highest poverty rate in the nation due to its affordable housing crisis. Many lower- and middle-income people are being priced out of their apartments. One proposed fix is on the ballot. It's a measure that would let cities enact stricter rent control. NPR's Kirk Siegler reports from Los Angeles. KIRK SIEGLER, BYLINE: You can add Robert Rodriguez to a growing list of Angelenos living right on the brink of homelessness. Rodriguez used to be a truck driver. He's 82. And when I met him, he was leaning on his walker outside his old apartment. He had been evicted the day before. ROBERT RODRIGUEZ: Everything is gone, yes. It's all in storage. SIEGLER: Now, in February, his landlord told him rent was going up by 15 percent to be followed by possibly another 30 to 40 percent increase. He couldn't pay. They went to eviction court. RODRIGUEZ: And in court, we lost. So I had to leave. SIEGLER: But where to go? His neighborhood, densely populated MacArthur Park with its many worn mid-century apartment buildings, is gentrifying. Landlords are suddenly asking and getting 2,000 a month or higher for one-bedrooms. Rodriguez can't afford that, and he's worried he'll end up homeless. RODRIGUEZ: It's an embarrassment more than anything else I think. At this point in my life, I should be sitting in a rocking chair, waiting for the pearly gates to open up for me. SIEGLER: California is now home to almost a quarter of this country's entire homeless population. This is an often-cited statistic for those backing Prop 10, which would allow cities to pass or expand rent control. It would repeal a law that prohibits rent control on any unit built after 1995 and a little earlier in some cities. PETER DREIER: California has the worst housing crisis in the country for two major reasons. SIEGLER: Peter Dreier's a former deputy mayor of Boston who now teaches public policy at Occidental College in LA. DREIER: Wages are stagnating for the majority of working families, and rents and home prices are going up much faster than wages. SIEGLER: And Dreier says the system is stacked against renters in particular. A report by the National Low Income Housing Coalition figured that just to afford market rent in LA right now you have to make at least $32 an hour. DREIER: We have a shortage of housing that's affordable to schoolteachers, that's affordable to firefighters, that's affordable to janitors, that's affordable to garment workers. SIEGLER: The people who make a city tick or any community. SIEGLER: But Prop 10 has its detractors, including people who build low-income rental housing. Elizabeth Bluhm is a project manager at a San Diego-based nonprofit developer called Wakeland Housing. She's worried that if it passes, there could be a patchwork of cities with different rent control laws and limits. ELIZABETH BLUHM: Which makes it very hard for developers to get things done efficiently because there's different rules to figure out in every city. And it just adds to the cost of development, which is part of the problem. SIEGLER: Bluhm says even just a little uncertainty threatens funding for a project because developers need to know how much rent they're going to bring in to cover their costs. Private firms like hers see themselves on the front line of fixing the housing crisis because federal housing subsidies for the poor have steadily declined since the 1980s. Bluhm says rent control is just a Band-Aid, and at the root of the problem is the fact that there's just not enough housing. BLUHM: The real solution to our affordable housing crisis is more construction of housing across the whole spectrum. SIEGLER: The state estimates it needs to build well over a million new units right now. Land is in short supply, and a lot of what is being built is high-end. And that's fueling a lot of the anger and momentum behind the push for rent control. Like in a lot of booming American cities, LA residents are watching as whole blocks are demolished to make way for luxury homes and big, fancy apartment complexes with pools and gyms. UNIDENTIFIED PROTESTERS: (Chanting) The rent, the rent is too damn high. The rent, the rent is too damn high. SIEGLER: Prop 10 supporters and neighbors of 82-year-old Robert Rodriguez are protesting on the street in front of his old building. The building's owners say the rent increases were needed to cover maintenance costs and are still below market rates. But for now, Roberts says he and his wife will stay with his sister while they desperately look for a new place. RODRIGUEZ: If you don't have family, you've got a problem. You've got a problem. MacArthur Park has filled up. All you've got left is Skid Row. SIEGLER: All you've got left is Skid Row. Rodriguez hopes it doesn't come to that. Kirk Siegler, NPR News, Los Angeles. Transcript provided by NPR, Copyright NPR.